The FreshLook Colors from CIBA Vision / Wesley Jessen is a frequent replacement lens designed to dramatically change the color of dark eyes. These bold and beautiful colored lenses are convenient, comfortable, and look completely natural. Choose from Blue, Violet, Hazel, or Green. If you would like to change the color of your eyes there are many choices available to you with Freshlook Colors by CIBA Vision. 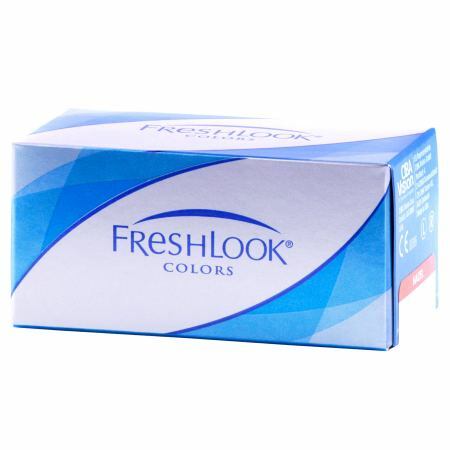 The Freshlook line of color contacts can work with light or dark eyes to completely change the color of the eyes or just enhance the natural color that you already have. It is not necessary to require a vision correction with these lenses, but you will need a prescription to get the Freshlook Colors lenses. The color lenses are designed to change the color of your eyes from one color to a different color, but there are Radiance lenses that will simply brighten the color of your existing color for a dramatic and beautiful look. The eye care professional will prescribe the lenses to be worn for a daily wear lens or extended wear from one to seven days. Only the eye care professional can determine whether you are suited to extended wear lenses. You should also follow the eye care professional's cleaning instructions for your color contact lenses. Choose from a wide variety of colors with the Freshlook Colors contact lenses. Whether you wish to dramatically change the color of your eyes or enhance the color that you already have, there is a contact lens that will suit your needs.